We are big fans of home birthday parties. And I have made a pinata for almost every birthday party we have hosted in the last two years. As a result of our experiences, I have learned a few things about homemade pinatas. Paper mache is not necessary to make a pinata. It will soon be broken, so the pinata doesn't have to be very sturdy. In fact, it is better if the pinata breaks fairly easily rather than having to be assaulted with deadly force. Especially when you have preschoolers as guests. Keep the finished pinatas out of reach of young children. We learned this the hard way when my son destroyed a lovely pinata my daughter had made by herself. Making a pinata usually takes a long time. Start it at least several days before the party. The traditional way of making pinatas takes days. We have avoided paper mache for the last few pinatas because it takes so long for them to dry before they can be decorated. Interesting in saving time? 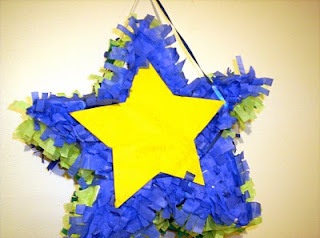 Check out my step-by-step tutorial on how to make a star pinata in under two hours over at Associated Content. The nice thing about star pinatas is that they work well for both boys and girls. Another pinata I made last year can be found in this post about my daughter's birthday party. The versatile star pinata can also be used to add fun to a Fourth of July celebration or Christmas party. Great job! The pinata looks wonderful. I made my son's pinata for his birthday also. It's so much more cost effective! They want 10 dollars or more for something that is going to get smashed! Thanks for sharing! thanks for the tips! i've always wanted to make one! Such a cute idea! 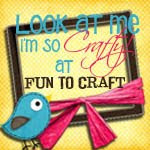 I love how quick and easy the pinata is to create - bookmarking this activity to feature one of these days!